They are a grave national security risk - everyone crossing the border illegally are foreign nationals and therefore constitutes a foreign invasion. Glad to see military/paramilitary militias alike taking control of the border and denying entry to illegals. And whatever force is necessary to defend our country, it is what it is. Invaders have been warned and told point blank not to come, that they won't be admitted under any circumstance and that turning around is the only solution. Thank you to all our brave citizen soldiers who defend our nation without any respect, funding or glory. You make me proud to be American. They haven't done anything yet so in control isn't in effect. It is sad it has come to this, but they just won't respect our border and our laws and now we are in the position of being forced to use extreme measures to defend our sovereignty. Whatever happens will be on the hands of the caravan and those funding/supporting it, and I hope any applicable post-action criminal charges reflect that reality. No sympathy for anarchists who refuse to follow the rule of law. That said, I can assure you from experience that the US military will not shoot people throwing rocks (unless they are employing other types of deadly force). There are many rules about employing deadly force in the military, the consequences to violating them quite severe. Guess we can quit the deadly force vs rocks hyperbole now...can’t we? 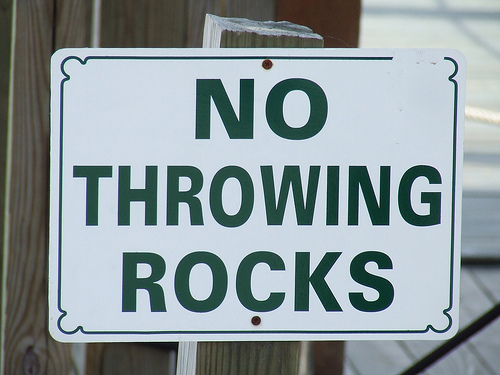 Is there a rule in the book where it says you cannot just shoot the hand that threw the rock thereby not making it a deadly engagement? Or put up signs..."Do Not Throw Rocks" in language that the caravan can read and understand. You know good and well how small a hand is right? no take into account how small it is at distance. We arent Robocops and cant shoot the wings off a fly. We deal in reality and if you are stupid enough to throw a rock,you deserve the stupid prize when they shoot you dead. They cant shoot even if they get hit with a rock. They cannot do what trump wants you to believe they can. And no they are not defending our country because we are not at war with these people. They are not agressors invading even though the idiot keeps saying that. Hes lying. And some people are lapping it up like a cat and a bowl of cream. Yeah dude, they're aggressors. They're invaders. We don't need anyone telling us that in order to believe it. Go grab a thousand people and bust through Canada's gates waving the US Flag and see what happens. Go bust through Mexico's gates waving your flag and see what happens. Go bust through Germany's gate waving your flag and see what happens. Go bust through China's gate waving your flag and see what happens. Go bust through Russia's gate waving your flag and see what happens.